Healthy grass is happy grass. When you give a little love, you get a lot back. At Nutri-Lawn, we deliver on our promise to nourish your lawn to health, all while using the most organic and ecologically sustainable solutions possible. Talk to your local Nutri-Lawn about the services they specialise in, such as irrigation, landscaping, lighting, or tree & shrub services. Get the grass you’ve always wanted. With seasonally timed applications of traditional fertilizer, weed control, and insect control, our Classic NL program will nourish your lawn and keep it looking its best all season long. Have peace of mind knowing you’re only using organically based products. 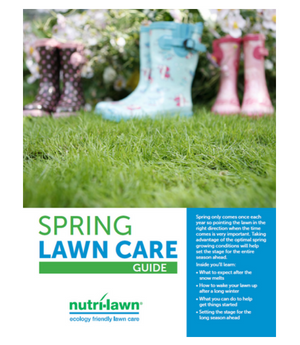 Our Organics NL program features seasonally timed treatments that ensure a healthy lawn with balanced fertility, minimised weeds, and less risk of insects - all without the use of synthetic pesticides. Get the best of both worlds with our Hybrid NL program. A specialised combination of classic and organic services are seasonally timed and applied to maintain a thick, healthy and lush lawn - all while effectively managing weed and insect infestations. Talk to your local Nutri-Lawn about programs available in your area. "We just wanted to compliment the work your technicians did on our lawn. The new sod that was installed looks great and the irrigation system you guys put in makes it so easy for us now."